Archer Mechanical offers the full mechanical contracting package of residential and commercial plumbing, heating, and gas installation for residential and commercial construction projects in Parksville, Qualicum, the Comox Valley, and Campbell River on Vancouver Island, BC. With just one phone call, Archer Mechanical provides plumbing, heating, gas, heating services, and complete mechanical installation packages to homeowners and businesses. Archer Mechanical also provides fire protection and sheet metal services. Established in May 2009, Archer Mechanical “takes pride in everything they do.” Archer Mechanical offers competitive rates, and discounts on multiple contracts. Doing their part to build green, Archer Mechanical installs high efficiency equipment like condensing tankless water heaters at cost. Contact them today at 250.331.3115. Eleven new homes in the 20-unit duplex project Woodcote Mews on Cumberland Road in Courtenay have been sold. These new Comox Valley duplex homes are 1,320 square feet and include a quality appliance package, consisting of a fridge, stove, dishwasher, washer and dryer. Some of the duplexes are already complete and the remainder have had the exterior framing completed. The developer will complete the interiors of the units, once the buyers have selected their colour schemes. The construction of all of the new homes is expected to fully completed in the fall of this year. Prices at Woodcote Mews start at $216,900. For more information, contact Realtor Scott Fraser, of Royal LePage in the Comox Valley, at 250.334.3124. Work has started on residential building lots in Morrison Creek Commons, a development of 69 new home lots off Arden Road in Courtenay on Vancouver Island. The first phase of the new building lots will be fully serviced soon and construction of the first new homes could begin as early as March. The design includes a new low-density subdivision that will incorporate 69 single-family homes on 7.7 hectares. The new Vancouver Island real estate project will include 50 per cent green-space to protect the wetland area around Morrison Creek. The project will be built in four stages and Phase I will include 17 lots. Mountain West Properties, a real estate development company from Victoria is accepting Expressions of Interest from general contractors. For more information regarding this real estate opportunity please direct inquires to joel@mountainwestproperties.ca or visit the Mountain West Properties website. Klitsa Signs is Vancouver Island’s premier sign shop. With locations in Port Alberni and Courtenay, on Vancouver Island, Klitsa Signs offers a full range of high quality sign services, including real estate signs, construction development signs, yard signs and vehicle graphics. Klitsa Signs also offers large-scale digital printing for photo signs, sandblasted cedar signs, awnings and more. The sign shop can also create your company logo, and add it to a variety of clothing items. 1stView recently visited the downtown Victoria office of the Oak Bay Beach Hotel at 1111 Wharf Street. While there, we were intrigued by the live web cam view showing the construction progress at the waterfront hotel site. "I could appreciate the stunning ocean views from an owner’s perspective, as it offered an unobstructed view of Chatham Island and the Oak Bay beach waterfront," said 1stView's Clarice Coty. Victoria’s Oak Bay Beach Hotel is offering buyers of their five-star vacation hotel suites and residences at the new Vancouver Island hotel development a 100% Buy Back Guarantee. Until March 15, 2011, Oak Bay Beach Hotel developer Walker Hospitality is offering a two-year, 100 percent buy back guarantee to any purchasers of their Luxury Waterfront Residences and their revenue-producing Vacation Hotel Suites in the new Oak Bay Beach Hotel. The offer is available for only a limited amount of Vacation Suites and Residences (20 per cent of available units). Seeing potential buyers’ anxiety over the recent soft economy “inspired us to express our confidence with a money back guarantee, taking away any downside to a commitment to purchase with us,” says Kevin Walker, owner of Walker Hospitality. All purchases must be completed before March 15, 2011 and a total refund will be granted to buyers two years after the time of occupancy, if they are not completely satisfied with their investment. The hotel is scheduled to open in Spring 2012. Pre-opening pricing starts at $299,000 (Vacation Hotel Suites, ranging from 400 – 750 square feet) and $1 million (Residences at Oak Bay Beach Hotel, ranging from 900- 1900 square feet.) The Oak Bay Beach Hotel has sold more than 45 per cent of its real estate inventory. The new Oak Bay Beach Hotel is being rebuilt on the same spectacular Vancouver Island oceanfront property where the previous hotel stood for over 80 years. It will reopen as a 100-room hotel with 20 luxury residences and vacation hotel suites built to five-star standard. Visit the Oak Bay Beach Hotel website for more information about purchasing a private residence or vacation hotel suite or call 1-800-668-7758. The Texada ocean view condominiums in Nanaimo are offering savings of more than $20,000 to new buyers. With more than 70% of the units sold, demand has been high for these luxury Vancouver Island condos, which offer views of the Georgia Straight and Coast Mountains from their large patios and balconies. There are only two of the extremely popular one-bedroom and den units still available, along with one bedroom, and two bedroom and den units. All condos at The Texada offer stainless steel appliances, hardwood floorings and other designer touches. Available condominiums start at $249,900. The Texada Sales Centre is located at: 6310 McRobb Avenue, Nanaimo, and is open 11 a.m. – 4 p.m. daily except Fridays. To find our more, call 250-390-0115 or visit The Texada website here. Realtor Tina Vincent is "Your Comox Valley Connection"
1stView toured The Slopes at Lake Cowichan project recently and saw some of the beautiful homes built here, which offer spectacular views of the surrounding Vancouver Island mountains. These new residential lots for sale are large - most of the lots are .25 acre or larger in size and they are located at the entrance to Lake Cowichan. The Slopes property is located in a sunny little valley, just a few minutes from both the Town of Lake Cowichan and from the waterfront of Lake Cowichan. It is 20 minutes from Duncan and about an hour’s drive to both Victoria and Nanaimo on Vancouver Island. These lots offer excellent value, starting at $99,000 and would appeal to first time buyers, families and people looking to build a Vancovuer Island vacation home. Vancouver Island’s Crown Isle Resort and Golf Community in Courtenay says the addition of a new regional hospital on the property fulfills a long-time vision. Last week the Vancouver Island Health Authority announced that the site for the new Comox Valley hospital will be on Crown Isle lands north of Ryan Road. "With this announcement, this truly moves Crown Isle forward as one of Western Canada's premiere communities," said Ron Coulson, one of the development's two owners. "Many developments show great vision and promise; ours has now become a reality." Coulson said Crown Isle expects to see more than $750 million in new construction over the next few years, with the new hospital, combined with Costco and additional commercial developments, and new residential real estate development. “The economic spin-off will greatly benefit the entire Comox Valley,” Coulson added. Crown Isle's Director of Real Estate, Jason Andrews said having the new hospital within Crown Isle further enhances the overall vision of the resort's Master Planned Community, "where you have all of the amenities in your own backyard: shopping, recreation, dining and health care all within walking distance of your home. "We believe we have created one of Western Canada's most complete and dynamic communities." Four Comox Valley businesses brought home impressive hardware and accolades from the 11th annual Business Examiner awards. Island Gourmet Trails' owner Gaetane Palardy was honoured as Vancouver Island Entrepreneur of the Year, coffee company Royston Roasting was name Manufacturer of the Year, 1stView was named Real Estate Company of the Year and Two Eagles Lodge was named Hospitality/Tourism Business of the Year. “Celebrating Business Excellence on Vancouver Island” the BE Awards were presented Jan. 27 at the Vancouver Island Conference Centre in Nanaimo. Awards were presented in 17 categories. 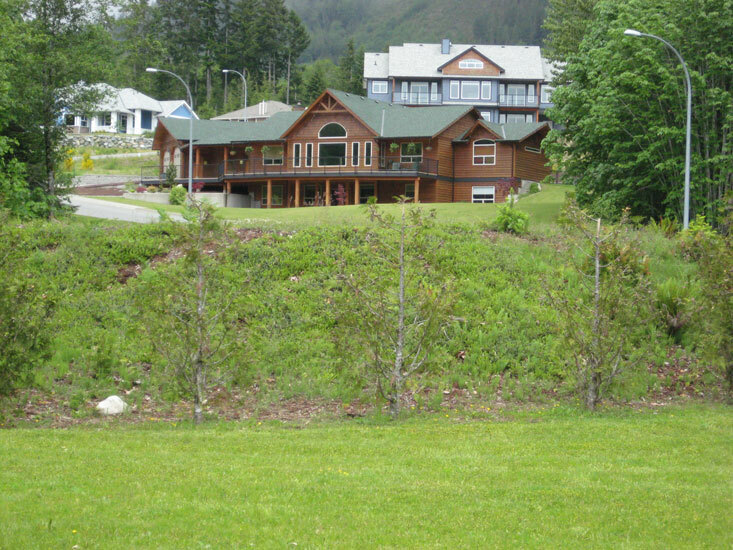 Two Eagles Lodge Bed and Breakfast in Union Bay also won the 2010 Torch Award from the Better Business Bureau. Real Estate Company of the Year, 1stView, offers a unique way to find new Vancouver Island Real Estate. Manufacturer of the Year, Royston Roasting Company produces quality, fair trade organic, artisan roasted coffee. They also go one green step further and package their fresh roasted beans in eco friendly bags made of rice paper. "Our success and this award would not be possible without the tremendous excitement and support we have received from our Comox Valley community and the many small businesses, friends, and colleagues that make our coffee a daily ritual and promote our company wherever they go," said owner Dyan Spink. Entrepreneur of the Year, Gaetane Palardy is the owner/operator of Island Gourmet Trails, which offers exciting, delicious, day-tours within the Comox Valley. Their culinary adventures are planned to cover different trails throughout the Valley, and from Parksville to Campbell River. MLS sales data released by the Vancouver Island Real Estate Board for January 2011 showed a small decrease in single family home sales from January 2010. January 2011 had 205 unit sales compared to the 225 units sold in January 2010. The total number of single family homes on Vancouver Island north of Victoria currently available is 2,055 units - up from the same time last year where the number of homes for sale on Vancouver Island were at 1,834. The average sale price across VIREB region for January 2011 is $321,489, down five per cent from the average sale price of $399,327 last January. Stability Wall Systems Ltd. specializes in building envelopes - from siding to soffits - for new construction, remediation, and renovations on Vancouver Island. The Stability Wall Systems staff are experts in the installation of Hardi-plank, vinyl siding and wood siding. The company also does custom flashings, detailed trim work, window and door installation, soffit, and all rain screen details. Based in the Comox Valley, they do business from Nanaimo to Campbell River. Stability Wall Systems offers very competitive rates and takes pride in their workmanship. To find our more, or for a free estimate email stabilitywallsystems@shaw.ca or call 250-218-9145. 1stView has been recognized as the Real Estate Company of the Year at the 11th Annual Business Examiner Awards. “I was honoured,” said Clarice Coty, owner of 1stView, of winning the award. Not a traditional real estate company, 1stView helps people find new Vancouver Island real estate including homes, vacation units and investment properties. 1stView is the premier online directory for home buyers and investors looking for new Vancouver Island real estate. In 2010, 1stView grew to see more than 20,000 visits per months, expanded its staff with the addition of a new marketing director, and a sales person for the launch of its new Vancouver Island Real Estate and Construction Directory. 1stView will soon launch a redesigned website, making it even easier to find new residential real estate and homes on Vancouver Island.